And the ds106 pre-course assignmnet craze moves into 11th gear. Michael Branson-Smith takes the movie poster into a new dimension with his iteration of American Werewolf in London featuring two different elements of movement life sizing the original page. Next, Jim Groom crams about 5 animated GIFs into one with his version of Jason and The Argonauts, turning the whole poster into an action scene. With some coincidence the story is based on the book authored by the same person who wrote the original Planet of the Apes, another old movie favorite of mine. I chose the poster base as one I found at All Movie Poster, because of its graphic style. My approach to this one was to bring it into PhotoShop, and separate key elements into separate layers. This took a variety of selection tools- the Magic lasson, the Polygon lasso, the new Quick Selection tool as well as the usual magic brushing and smudging to fill in areas. In the animation window, I toggled up the other tools on the left to experiment with adding key frames for position and opacity, to make the parts I made move and fade. Its not flash animation, more like the Monty Python-ish sliding things around. This form of GIF of course needs more frames; this one expanded to 89 frames. The GIF dithering actually adds tom fun to my little painted in explosion. Anyhow, fitting for the beginning of ds106 comiing soon, the closing key quote from Major Clipton comes in handy. Nothing finer than blowing things up! Thanks for the screener to show how you’re using the animation window in Photoshop, which is the ‘Timeline’ mode. I’ve been using the ‘Frames’ mode so I’m looking forward to trying some of your methods. The sliding of elements is really cool, and particularly effective for showing the bridge collapse (also with the clever use of opacity changes). This looked great! 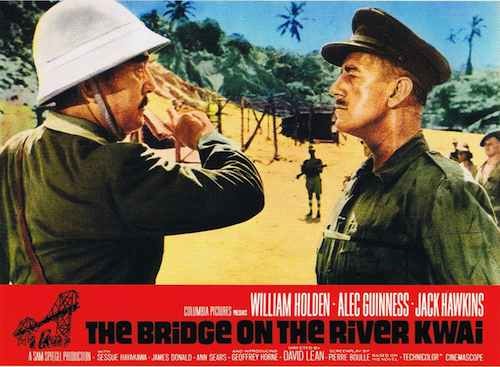 We actually went to the real Bridge over the River Kwai in Thailand. It was an eerie place to be. Nothing like the film.